My textbook says one of the functions of a salt bridge is that "it completes the circuit by allowing ions to move from one half-cell to another". However, according to my understanding, only the ions in the salt bridge move into the half-cells. Take the above chemical cell as an example, only the potassium ions and nitrate ions move into different half-cell respectively. 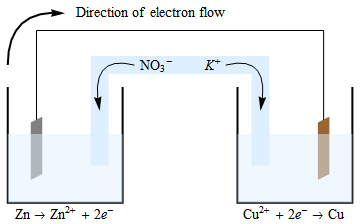 The mobile ions in the two electrolyte do not move from one half-cell to another, right?